Upon arrival Ho Chi Minh City, welcomed by our Tour Guide & Car Driver at the airport then transferred to your hotel in city centre. Check in and stay overnight in Ho Chi Minh City. Pick up at your hotel in HCMC at 7.30 AM . Depart for Cai Be, stopping to take photos in Tan An town overlooking the picturesque flat rice fields. On arrival in Cai Be, take a motor boat to visit the Cai Be floating market and watch the locals trading fruit and many other commodities on board their vessels. Then wander into the small villages to visit the orchard and fruit plantation. Keep cruising to Vinh Long through a series of small canals to experience the charms of the Upper Mekong Delta. Visit a small family business to see how coconut candy and crispy rice popcorn are made. Arrive in Binh Hoa Phuoc village, the green pearl of Vinh Long town, where you can immerse yourself in nature. Enjoy a lunch of fresh river food served in the heart of the garden accompanied by traditional southern Vietnamese folk music. Take a delightful walk through the bonsai garden. Meet the driver again in Vinh Long. Return to HCMC. Arrive back your hotel at around 5.00 pm. In the morning, we pick you up at your hotel at 8.00 AM. we have an excursion to the famous Cu Chi tunnels. This network of tunnels, which stretched for over 200km, became legendary during the 1960s. The Cu Chi tunnels played a vital part in the U.S.-Vietnam War in that they allowed the Viet Cong to control a large rural area only 30 to 40 km from Saigon . At its height, the tunnel system stretched from Saigon to the Cambodian border. The network, parts of which were several levels deep, included innumerable trap doors, specifically constructed living areas, storage facilities, weapons factories, field hospitals, command centres and kitchens. Today the remaining tunnels have become a major tourist attraction giving the visitor a unique experience and feel of what underground life during the war must have been like. The tunnels have been widened for our benefit (otherwise we would not be able to enter them!) For those interested there s even the opportunity to fire off rounds from an AK47 or MK16 at the nearby rifle range. In the afternoon, we visit Ho Chi Minh City, formerly known as Saigon, is the largest and busiest city in Vietnam with a population of 7 million people. Much of the daily life takes place on the streets, which are lined with shops, stalls and vendors with their wares spread out on the footpath. Don t miss the bustling Ben Thanh Market - a fantastic place for bargains of every kind! There are several interesting sights in HCMC. The War Remnants Museum has a wealth of images from the wars, the most moving being a gallery entitled Requiem which is dedicated to Vietnamese and foreign journalists and photographers who perished during the French and American conflicts. The Reunification Palace was the former residence of the President of South Vietnam until April 30, 1975 when the North Vietnamese tanks came crashing through the front gates, bringing the U.S.-Vietnam War to a dramatic end. Close to the palace some of the best examples of French colonial architecture are represented in the forms of Notre Dame Cathedral and the Central Post Office. Notre Dame Cathedral was built between 1877 and 1883 and the stone used to create it was exported in its entirety from France . Next to the cathedral stands the Central Post Office , finished in 1891. 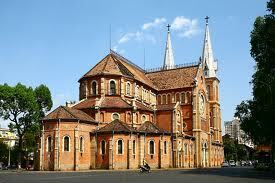 It is another fine example of French architecture and is Vietnam s largest post office. For all its French colonial history though, Ho Chi Minh City is by far and away Vietnam s most modern city. It has numerous shopping malls, cinemas, discotheques and a bewildering number of bars. Overnight at the hotel in Ho Chi Minh City. Take the flight to Seam Riep after breakfast at your hotel in HCMC. We meet at the airport and transfer to hotel in town and carry on with the excursion to the South Gate of Angkor Thom, Bayon, Baphoun, Terrace of Elephants and Terrace of the Leper King Afternoon visit to world-famous Angkor Wat. Watch the impressive sunset from Phnom Bakheng. Overnight at the hotel in Seam Riep. Early morning, we will take an opportunity to view the beautiful sunrise at Angkor Wat (optional) and then return to hotel for breakfast. In the same morning, tour to the Small Circuit including Banteay Kdei, Srah Srang, Ta Prohm, Takeo, Thommanon, and Chau Say Tevoda. In the afternoon, visit the Grand Circuit including Prasat Kravan, East Mebon, Pre Rup and Preah Khan. Dinner will be served at restaurant with traditional dance show. We will take morning visit to Roluos Group including Prasat Preah Ko, Bakong, Lo Lei. In the afternoon, take an appealing boat trip on the Tonle Sap to see the fisherman villages and visit the Siem Reap Market. Free at our own leisure until transfer to the airport for departure flight. *** The hotels that listed as above are subject to availability of the hotels. In the case of any or all these hotels not being available we will make every reasonable effort to substitute accommodation of similar standard. Customer can choose other hotels which are different from above list then Vietviewtravel’s consultant will re-quote the trip base on selected hotels.